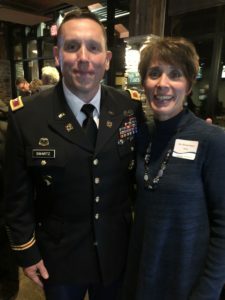 Tannersville – Board Members, Legislators, PMEDC Members, local businesses and economic development enthusiasts gathered last evening at Trails End in the Camelback Lodge to celebrate another year of economic development success in Monroe County. 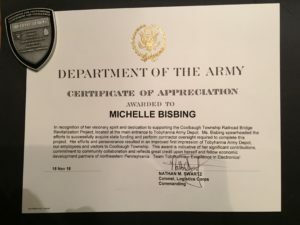 Team Tobyhanna also presented PMEDC Marketing Director, Michelle Bisbing with a Certificate of Appreciation and engraved shield for Outstanding Achievement and Excellence. 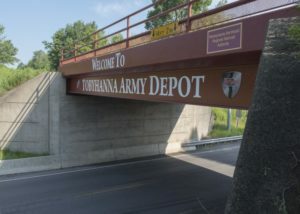 Ms. Bisbing worked with the depot staff and the PA Regional Railroad Authority to complete the façade improvement of the railroad trestle at the entrance to the depot. The project was funded by a Local Share Account for Monroe County grant and was completed this past June. In his closing remarks, Chuck Leonard, PMEDC Executive Director recognized the coming retirement of Mr. Marc Troutman of Met Ed and the recent promotion of NEPA Alliance’s Debbie Langan to Senior Program Manager for the International Business Development program. Ms. Langan will take over for the retiring Mike Horvath.